I was all set to get the pain au chocolat when I noticed the chocolate "brioche suisses" in the window. It looked chocolate-y, like a glazed, elogated rectangular cousin of the chocolate croissant. Both were $2.75. So I put it to the guy behind the counter. What was the difference? His words? 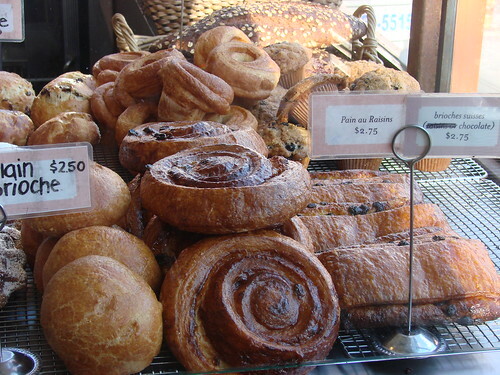 "The brioche suisses is like the pain au chocolat but more flavorful." More flavorful? I'll take it. The pastry lived up to the more flavorful promise. 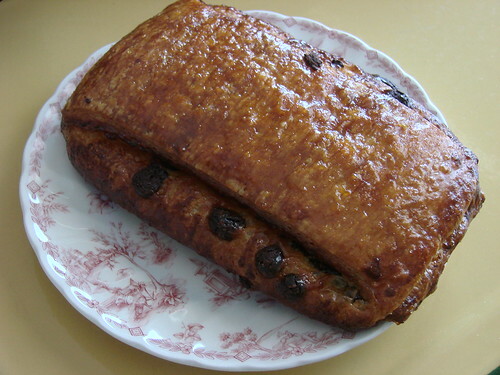 The light sweet glaze is very pleasant and it seemed to have more chocolate filling than your typically get with your standard pain au chocolat. For science, and of course for you, dear readers, I've returned several times since to, you know, check the quality and I can say that these have always been top notch and are now a favored treat around our place. I am a new follower to your blog and omg your pictures look so yummy! Making me hungry haha. I've been on a quest for morning buns since Tartine got me hooked, so we went to Colson's a few weeks ago in search of an east coast substitute! Tartine will forever be #1, but Colson's financiers are AWESOME and bear-shaped. Love the Post. And the blog! If you ever want to learn really great cupcake hot spots in the city be sure to check out Cupcakes and the City! Colsons is my favorite bakery in the neighborhood. Their baguettes are great, as are the financiers. But my absolute favorite--one of the most amazing things ever!--is the salted, chocolate, caramel tart. Yumm!!! @the [sugar] apothecary: those bear shaped financiers are so adorable! They had some very pretty raspberry (?) ones last time I was there. I wish I could try them. Darn nut allergy! Lucie: hmmm. I don't think there was any cream. Where do you go brioche suisse?